The operating system for the Raspberry Pi is started from an SD memory card (SD or microSD card) and must first be written to this memory card. The choice of memory cards is enormous. From no name to brand manufacturers everything is represented. The typical storage capacity ranges from 4 to 512 GB. The operating system for Raspberry Pi is started from an SD memory card (SD or microSD card) and must first be written to this memory card. The choice of memory cards is enormous. From no name to brand manufacturers everything is represented. The typical storage capacity ranges from 4 to 512 GB. The following article clarifies what to look out for to get the most out of speed and still not pay too much. SD cards have different speed classes. Normally we speak of Class 4, 6 or 10. Where the class stands for a write speed of at least x MByte per second. For Class 10 (UHS1) it is at least 10 MB per second. Of course that's not very fast. Much more is not possible with SD cards. Basically, the fastest possible card is to be used. Not only because data is stored on it faster, but also because you need to bring the image to the SD card. Of course, it takes longer for a slow card. The bigger the image, the longer it takes. The situation is different with the reading speed. Here fast SD cards create 45 or even 90 MB / s. Now you might think "the faster the better". But that's not true. On SD cards in cameras, pictures and videos are read and written sequentially. The specified speeds with a USB 3.0 card reader are quite achievable. Different in a computer. Here the reading and writing take place where the file is currently (random). Here it comes to bear that these files are generally smaller, which is why the specified speeds are never achievable. Raspberry Pi has a read speed of just over 20 MB / s. Basically enough for Raspberry Pi SD memory cards with Class 4 or Class 6. But if you want to pull a backup from an SD card or write an image on it, then an SD card with a high speed of advantage. But that's really the only reason why you should have a fast memory card for Raspberry Pi. The storage capacity depends essentially on what you want to do with it. As a rule, 8 GB are sufficient. Smaller in no case, because then you need special images. But this is not for beginners, because under certain circumstances important drivers and libraries are missing that are already in a standard image. An SD card larger than 32 GB does not make sense because SD cards are more unreliable. If you want to save data with Raspberry Pi, you should do it on a USB stick or a USB hard disk. An aspect to consider when choosing storage capacity. An SD memory card is a flash memory whose memory cells cannot be written indefinitely. Over time, the stability of the cells diminishes due to the limited "write cycles" and breaks down. Especially in cheap memory cards is not the highest quality flash memory installed. So, if you're looking for a write-intensive, year-long application, then you should consider using a memory card with a slightly larger storage capacity and / or better quality. With the memory card size one should consider also, that the backup of an image just as large fails. So at 8 GB it is 8 GB, at 16 GB it is 16 GB, and so on. If you create images for different systems and several backups, then you quickly get to several 100 GB. You have to be able to save that somewhere. It also takes a while to copy such large files between volumes. In general, one should not choose the storage capacity larger than absolutely necessary. It is generally advisable to use memory cards with 8 GB. There is also enough space if you want to install software. SD card are not suitable as a permanent data storage. Because these things have to be produced more and more cheaply, they are becoming more and more unreliable. As data storage USB sticks or USB hard drives are better. They are safer. An alternative is network drives (NAS) as data storage, for example, have redundancy (RAID 1 or 5). Variable data should be backed up regularly to an external data store. This is for example a USB stick. Generally, it is recommended to buy only Micro-SD cards. Even if you work with models A and B. The micro-SD cards can then be plugged into these two models via an adapter. Problems do not make the adapters. 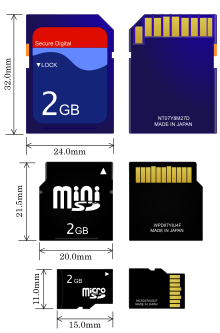 And if you buy the micro-SD cards individually, then you get the SD card adapter included. In addition to no name memory cards are also one or the other well-known manufacturers with SD memory cards on the market. To mention are Sandisk, Transcend, and Kingston. Noname cards are cheap, but you do not know what you get. It's not about bad quality or reliability, but more about their compatibility. This raises the question, is the memory card recognized by Raspberry Pi? Very annoying, if not. If you absolutely have to save, then you can safely buy memory cards from Transcend, Samsung, and Kingston. Where the price differences are not that big. If it does not depend on the Euro and quality and reliability are important, then the SD memory cards from Sandisk are worth a recommendation.